The laureate of this year's Anton Paar Award for Chemistry is Benedikt Warth, Assistant Professor at the Department of Food Chemistry and Toxicology (University of Vienna). He received the award for his work on "Identification of a novel human deoxynivalenol metabolite enhancing proliferation of intestinal and urinary ladder cells". Benedikt Warth started his career with his studies at the Universität für Bodenkultur (BOKU, University of Natural Resources and Life Sciences) in Vienna. He also graduated in Biotechnology with Honors there. In the year 2012 he achieved his doctorate (PhD) with honors in Analytical Chemistry, also at the BOKU. Research fellowships in Sweden (Linköping University), at the Department of Agrobiotechnology (IFA-Tulln) and The Scripps Research Institute (La Jolla, California) round up his CV. Since July 2017 he is Assistant Professor at the University of Vienna. 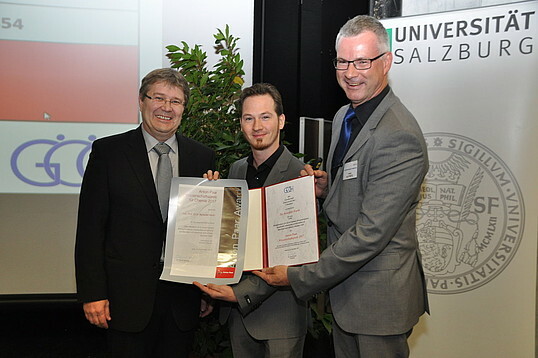 The Anton Paar Award for Chemistry is awarded yearly in cooperation with GÖCH, Austria's largest Chemistry Society.